Custom signatures allow you to save time and create a distinctive signature attached to every email. This article shows you how to create a custom signature for each of the Webmail clients offered with A2 Hosting products. Click the Options tab near the top of the screen. Click the triangle next to Mail in the left navigation area. Enter your signature in the editor pane and click the Enable Email Signature checkbox. Click the Save button when you are finished editing your signature. Click on the Settings menu in the upper right corner of the screen. Click Identities on the following page. Select an Identity to change from the Identities column. Enter your signature in the Signature text box. To create an HTML signature including images, links and text styling, click the HTML signature checkbox. Hover the mouse cursor over the menu item shaped like a gear. Select Preferences > Mail from the flyout menu. Click Personal Information on the following page. Select your identity from the drop-down list at the top. It is likely you only have a default identity. Enter your signature in the Your Signature text box. There is also an HTML editor to add an HTML signature that can include images, links and text styling. Click the Options menu at the top of the page. On the Options page, click Personal Information. 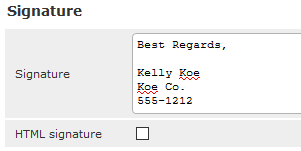 On the Personal Information page, fill in the Signature textbox. Click the Submit button when you are finished editing your signature. By default, users must choose a client application (Horde, Roundcube, or SquirrelMail) after they log in to webmail. However, you can use redirects to enable users to log in directly to webmail without having to choose a client application. 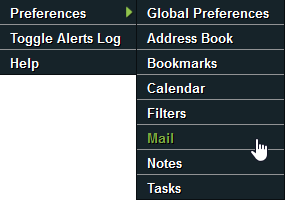 You can easily change time zone settings in the Horde, Roundcube, and SquirrelMail webmail clients. Learn how here.